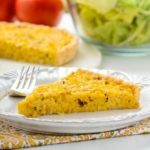 A recipe for Hatch Chile Corn Quiche made with fresh or frozen corn kernels, hatch green chiles, bacon, and onion. Serve it for lunch, brunch, or dinner. Roll out pie crust dough to a 12-inch circle (about 1/8-inch thick). Roll the dough up on the rolling pin and un-roll it over a 10-inch tart pan. Lightly press the dough in place. Fold edges in if overlapping. Cut a square of aluminum foil 4 inches larger than the tart pan. Lightly butter the shiny side. Turn the foil over (shiny side down) and make a pouch of it. Fill the pouch with a dried beans or pie weights. Line the dough with the foil and press it against the edges. Make sure the beans or pie weights cover the entire bottom and are against the sides. Bake the crust for 10 minutes. Remove the foil and beans/weights and prick the bottom again with a fork. Bake a few minutes more until the pastry begins to color and separate from the side of the pan. Cool 10 minutes in the pan then remove it to cool on a rack. Once cooled completely, place the crust back in the tart pan. Cook bacon in a skillet until crisp. Transfer cooked bacon to a paper towel lined plate. Add enough olive oil to the skillet to make about 1 tablespoon of fat/oil in the pan. Add onions to the skillet and cook until soften and translucent. Remove skillet from heat. Place the corn kernels in a food processor fitted with a knife blade. Pulse a few times to break up the kernels. Do not over-process. You want the kernels to be chopped and not puréed. Transfer the chopped corn kernels to a large bowl. Crumble the bacon. Add bacon crumbles, cooked onion, hatch chile, and cheese. Stir to combine. Whisk together eggs, cream, flour, salt, and pepper. Add to corn mixture and stir to combine. Pour into pre-baked tart crust. Bake for 40 minutes or until lightly browned and set. *You can substitute 1 or 2 seeded and chopped jalapeño peppers for the hatch chile.